RICK Astley popped into a Scots hairdresser to get his famous quiff done just hours before he was due to perform on stage. The star who was playing Glasgow's Royal Concert Hall phoned into Taylor Ferguson salon in Glasgow himself to make the appointment under the name Astley but staff didn't twig who he was until he walked in. Anne Ferguson who took the appointment said: " I spoke to him on the phone when he booked in but I didn't realise it was him. I thought I recognised him a bit when he came in but just thought he was one of our clients from down south. A lady whose husband bought her a voucher for the salon couldn't believe it when she was told he was sitting behind her. She'd not managed to get a ticket for the gig so was thrilled. She got up and had her picture and phoned her husband excitedly to thank him for organising it. Rick got a cut and style and has fabulous hair that has not deteriorated with age." 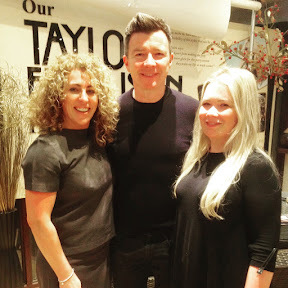 Beauty therapist Leanne Donovan and stylist Linda Browne were thrilled to meet him. Leanne who is a huge fan and bought tickets to the gig said: "We put on the music and I offered to be his backing singer or dancer. I was sending about and he was killing himself laughing. He was lovely and at the end of the concert I told him he was fabulous and he said he was loving his hair."